The 800 lbs Gorilla in the industry. Prepare for battle. Make sure there's a Gorilla Mill® on board. 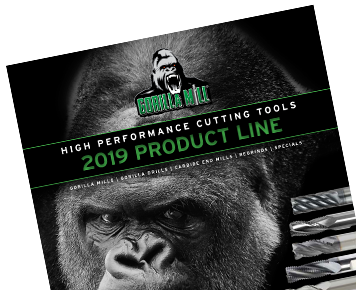 Each Gorilla Mill® is designed on our 3D CAD simulator, then crafted on state of the art CNC, auto loading cutter grinders, assuring absolute perfection and repeatability. Gorilla Mill® regrinds are sharpened using a modified version of the same program that is used to manufacture it new, thereby insuring 80% to 100% of a new Gorilla Mill's® performance. Our distributor network has grown enormously over the past years due to the popularity of this design. In most cases, Gorilla Mills® can ship the same day. Gorilla Mills® are routinely produced in special diameters, radii and lengths. 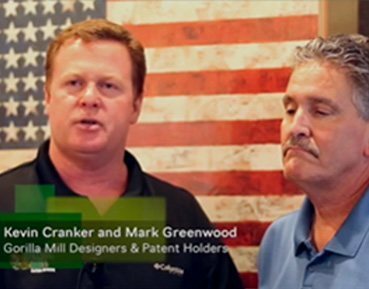 Need a custom Gorilla Mill®? Not a problem. Let our staff of over educated,over worked, underpaid engineers work with you to design and manufacture your high performance end mill and cutting tool. The marketplace is overwhelmed with variable helix end mills. Like the Gorilla Mill®, some are patented, most are not. One thing that matters most is performance in the machine tools. Gorilla Mills® will reduce chatter, decrease cycle times, extend tool life and create a superior tolerance and finish.